Star Trek is filled with advice that apply to today’s tech professionals. Here’s a look at seven from the Enterprise’s most logical crew member, Spock. It’s no surprise that many network engineers are also fans of Star Trek. Personally, I have been a Trekkie for as long as I can remember. One of the appealing things about Star Trek is that it pushed the limits of what’s possible. In fact, many technologies we take for granted today were previewed on Star Trek over 50 years ago. Things such as wireless communications, immersive videoconferencing and tablet computers were all used regularly on the Starship Enterprise long before we used them down on Earth. This week, the next wave of Star Trek kicked off with “Discovery” airing on CBS. As the dawn of this new era begins, I thought it would be fun to look back at the top seven quotes from Star Trek’s most logical person, Spock, which network managers should embrace. Incidentally, I chose seven because of the Galileo 7 episode, which was Spock’s first command. 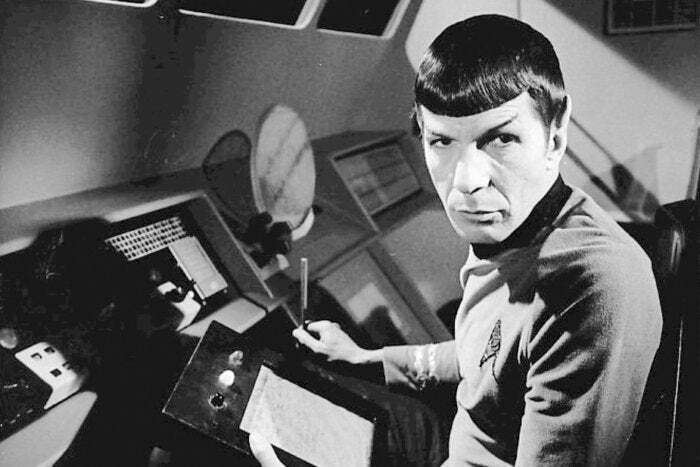 When Spock said that, he was referring to Dr. Richard Daystrom’s AI, the M5 Multitronic System, running the Enterprise. I know network engineers are facing the reality that machine learning and artificial intelligence (AI) are coming to the network and coming at warp speed. Technology professionals shouldn’t fear machine learning. Instead embrace it, and use it because that servant can do all the tactical tasks that are holding people back from focusing on strategic initiatives. Kirk was trying to get a theory out of Spock as to where the Botany Bay came from. Instead of guessing with no facts, Spock chose to wait until he had more data. Most seasoned engineers have enough experience to often guess at to what might be causing a problem. Heed Spock’s words, and don’t make a decision based on gut feel. Collect data, analyze it and make decisions based on fact. This will prevent network operations from spending hours guessing at what the problem might be and then spending an equally long time trying to undo the changes that were made when they realized that wasn’t the problem after all. During this episode, some of the crew were seeing visions of the Captain even though he was presumed dead. Spock surmised that people saw him because they wanted to and not because he was really still alive. In network operations, this typically happens in the troubleshooting phase and underscores the importance of end-to-end visibility across the network, compute and application tiers. When users complain there is a problem, it’s easy to assume it’s the user doing something wrong, particularly if everything on the dashboard is “green.” Network management needs to evolve from focusing on outages to focusing on performance so the people who run the network see what they need to see instead of what they want to see. With the Enterprise in imminent danger, Spock chose to go into a radiation chamber and save the ship but died in the process. Before he passed, he told Kirk that he did what he did because the needs of the many outweighed the needs of the few, or the one in this case. In the following movie, Search for Spock, Kirk and gang went to find Spock reincarnated because the needs of the one outweighed the needs of the many. What does this have to do with networking? Network engineers face this conundrum all the time, as applications that are critical to business operations (the many) are normally prioritized over bandwidth-consuming apps used by a small group of people (the few). However, there are cases where one particular user’s needs might be so important that it should be prioritized over everything else. One such example is a video call between a CEO and a top customer. For network operations, it’s far too demanding to constantly be fiddling with VLANs, QoS settings, etc. every time the needs of the few or many flip flop priority. Shift to an intent-based model where policies can be set and automation tools can ensure the best decisions are made. In this episode, the ship encounters a person named Lokai who is being pursued by another named Bele. The chase has been going on for 50,000 Earth years. Kirk urges them to change, but Bele says he can’t. This is when Spock quips the wise quote. Many network engineers I know do not want to change, and they fear change. Automation, intent-based solutions and software can scare the pointy ears right off a Vulcan’s head. However, to stay relevant, all IT pros must change and learn new skills. This includes how to work with software, data analytics and cloud skills. Without changing your skill set, this may indeed be your last battlefield. This is from the same episode as in quote 5. Lokai and Bele come from different backgrounds (one is white and black and the other black and white) and have drastically different views. This can often lead to nonsensical gibberish, as the lenses that each looks at the universe in are light years apart. This reminds me of the opposing points of view that the application development team often has compared to the infrastructure team. One CIO I recently talked with said this type of organizational structure was “insane.” In this era of digital transformation, where businesses need to move with speed, it’s critical that app development and infrastructure be brought together and given a common set of goals to avoid the nonsense that Kirk and Spock had to deal with when negotiating with Lokai and Bele.